The Peoples Democratic Party has outlined how its 2019 presidential candidate will emerge. In a 40-page document titled ‘Electoral Guideline for the PDP, Directorate of Organisation and Mobilisation’, exclusively obtained by the Media in Abuja on Saturday, the party said its presidential aspirants are to pay a total sum of N12m for both nomination and expression of interest forms, respectively. However, female aspirants are to pay only N2m for expression of interest form as they are exempted from the payment of N10m nomination fee. The document that explained these modalities was signed by the National Chairman of the PDP, Prince Uche Secondus and the National Secretary of the party, Senator Umaru Tsauri. The party said all aspirants are to swear to an oath to abide by the decisions of the party on the conduct of its primary elections. The document added, “A copy of the voter’s registration card of the aspirant shall be attached to the duly completed nomination form. “To be accompanied by a sworn declaration made before a Commissioner of Oaths or notary public; undertaking to abide by the guidelines, all laws and any rules or regulations made by the party for the conduct of the primary elections. The party stated that its NEC would appoint a Presidential Screening Committee on the recommendation of the NWC. 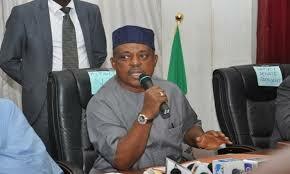 It added that aggrieved aspirants, who fail the screening exercise, would be free to appeal to a panel that would be led by Secondus, which will also include all other members of the NWC. On the payment of fees, the party said, “An aspirant shall obtain the expression of interest forms code PD002/P upon payment of the non-refundable fee of N2m from the national secretariat of the party or such place as may be designated by the NWC of the party, and, on completion, return same to the national secretariat. It was however silent on the modalities to determine the financial status of the aspirants. The document was however silent on the date and venue of the special national convention where the candidate would emerge. Part of the qualifications listed for its presidential aspirants are that they must be citizens of Nigeria by birth and that they must not be below the age of 40. The aspirants are also expected to be registered voters and must attach a copy of their voter card and registration cards to their duly completed form code PD003/P. Among those who have declared their intention to run for Presidency on the platform of the PDP are a former Vice President, Atiku Abubakar; a former Governor of Kano State, Ibrahim Shekarau; Governor of Gombe State, Ibrahim Dankwambo; Governor of Ekiti State, Ayo Fayose; and a former Minister of Special Duties, Tanimu Turaki (SAN). There are unconfirmed reports that a few members of the ruling All Progressives Congress may defect to the former ruling party to vie for its presidential ticket. Falana, in an interview with a media outlet, threatened to take legal action against political parties that were still selling nomination forms to aspirants despite previous court judgments prohibiting such payment.